A December 2017 false-color image made available by NASA in February 2018 shows KBO (Kuiper Belt object) 2012 HZ84. 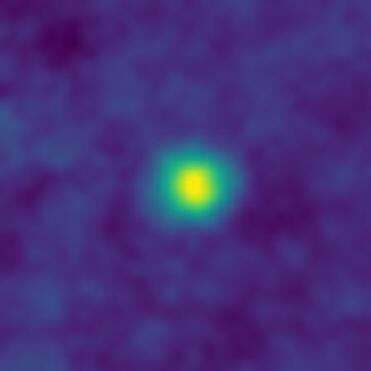 It was made by the New Horizons at 3.79 billion miles from Earth. In December — while 3.79 billion miles (6.12 billion kilometers) from Earth — the New Horizons spacecraft snapped a picture of a star cluster. The photo surpassed the ‘‘Pale Blue Dot’’ images of Earth taken in 1990 by NASA’s Voyager 1. The images for ‘‘Pale Blue Dot’’ — part of a composite — were taken 3.75 billion miles (6.06 billion kilometers) away. ‘‘New Horizons just couldn’t be better ... we’re bearing down on our flyby target,’’ said lead scientist Alan Stern of the Southwest Research Institute in Boulder, Colorado.